Invent Play Learn Ltd is the company behind Tio, the kit to build app-controlled toys and inventions in seconds. The Tio kit encourages creativity and long term play by combining the feeling of creating with your own hands and the power of today’s technology. It comprises connected hardware, magnetic mounts, wheels and other accessories that can be attached to almost anything including recycled and craft material, lego, old toys, gadgets and even 3D prints. Using the kit, adults and children alike, can create an infinite number of toys and animate the world around them. The interactive learning app customises and programs the toys. It controls many features like speed, direction and colours. Key to the experience is the Tio storybook, full of friendly characters who guide children through imaginary worlds and their first creations. The Tio team shares a vision to inspire tomorrow’s inventors with a new way of inventing, playing and learning. “In the early phase of the project, we were approached by co-founder, Peter Spence, to produce some 3D printed components to test his digital design for the Tio parts. To make these, we used our Objet Printer with VeroClear resin. This material has properties similar to acrylic and is transparent, so Peter was able to clearly see the internal details of the parts. 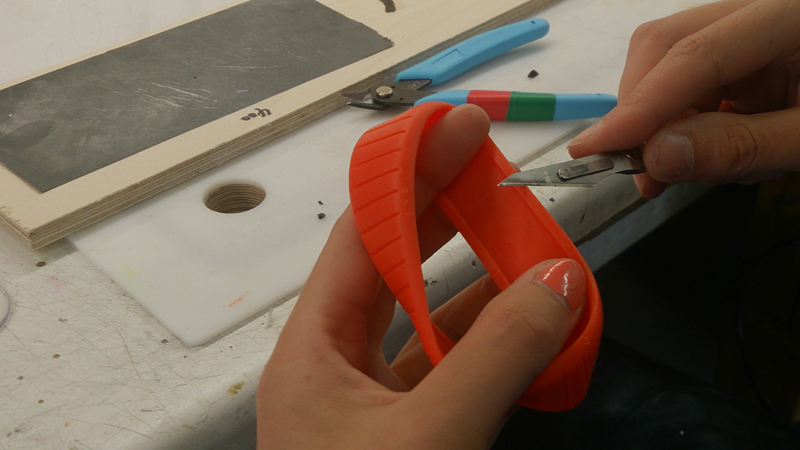 This step in the prototyping process aided Peter to develop the design further. Once the design development phase was complete, Peter approached us again with the brief to produce casing units for fully working prototypes of the Tio units. The challenge was to create eight units for demonstration purposes – and these needed to be attractive enough to enter competitions and underpin the Kickstarter campaign for Tio. The first step for the prototype was to produce new 3D prints, which were then prepared as vacuum casting masters. Peter had adjusted the design since the first round of components were printed, and specified the desired finish. This means the parts required hand-finishing to achieve a high gloss finish for all clear components, and a smooth satin finish for the coloured components. Parts are always checked for fit, and then we invite the product designer or inventor in to double-check them and discuss development. Once these components were ready for Tio, we went ahead with the tooling. To ensure we produced these components as efficiently as possible, we created multi-cavity moulds to then vacuum cast multiple parts of similar size and material in selected single moulds. Our process always protects the critical dimensions and fine detailing. Once the silicon moulds were complete, then the fun began with the casting process. Each component was cast in the appropriate material, which is where knowledge of plastics and experience in the casting team is critical. To fit with Peter’s brief, we selected optic clear and high impact ABS for the Tio components. ABS are resins from the family of thermoplastics, called terpolymers, because they are made of three different monomers: Acrylonitrile, Butadiene and Styrene. ABS is created as a single material that draws on the best properties of all three. We had Pantone references for a few of the favoured bright colours for the Tio prototypes, which we then colour matched during the casting process. For this project, our service included fitting the magnets and constructing the eight fully working cases, ready for the electronics to be fitted. So the next phase was most interesting – assembling the units and seeing the parts come together. In some projects, the inventor or designers take the component parts back to their team for further development. For Tio, Peter spent a day with us, assisting with some of the final assembly, and fitting printed circuit boards and motors. The large volume of components stayed with us, to be fettled and adjusted for fit to meet the critical dimensions of the design. Working this closely with the client allowed us to make sure we produced exactly what he required to bring the Tio kit to life. As with many of our projects, timing was critical for Peter to have a functioning prototype ready to launch Tio. These parts needed to be turned around in a very short amount of time, so Invent Play Learn could film their digital content and promote it around the world. We were delighted to see the team win NACUE’s Varsity Pitch and will continue to watch their progress! 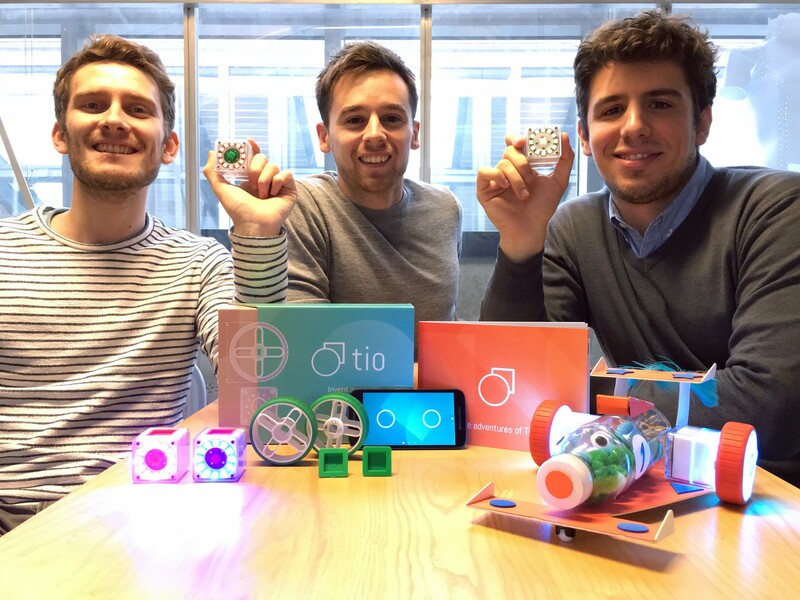 Based in Central London, Tio was dreamt up by three aspiring innovators with a vision to inspire tomorrow’s inventors. Kids at heart, they are dedicated to creating a new way of inventing, playing and learning. Tio was recently featured in the Daily Telegraph, Guardian, Huffington Post and E&T Magazine.